The bravest of the Knights of the Round Table was always said to have been Sir Lancelot. Though a French knight, he, of course, had a home in Britain as well. However, is this spectacular Northerly Castle really very likely? The Tradition: The evil Sir Brian of the Isles lived at Dolorous Guard. It was a dangerous enchanted place where passing knights by would find themselves obliged to fight two sets of ten knights at the two gates. They were never successful and were locked up in the nearby Dolorous Prison, while memorial gravestones marked their demise. Victims included Sirs Yder, Guivret, Yvain of Leonel, Cadoain, Kehedin, Kay Le Strange, Girflet, Dodinel, Taulas, Mador, Galegantin, Gawain and King Arthur's illegitimate son, Sir Loholt. Eventually, with the help of several magical shields, Sir Lancelot defeated the mystical knights and released all the prisoners. Sir Brian fled to Pendragon Castle and Lancelot took on Dolorous Guard as his new home. However, in order to free the castle residents completely from their enchantment, Lancelot had to stay there for forty consecutive nights. His many adventures, of course, kept him away and his new vassals became quite annoyed. So he descended, through the castle chapel, into a cave beneath where he defeated a huge monster and won the keys to unlock the enchantment from a damsel dressed in copper. The menacing gravestones magically disappeared and Lancelot decided to rename the place as Joyous Guard. Sir Lancelot was continued to be an intermittent resident, but he entertained many of his fellows at the castle. He buried his friend, Sir Galehaut in the castle chapel there; but the most notable visitors were Sir Tristram and his lover, Isolde. They made it their home after having fled the court of Isolde's husband, King Mark of Cornwall; but Sir Tristram left to take part in the Grail Quest and Mark's armies soon restored his wife to him. When Lancelot rescued his own lover, Queen Guinevere, from being burnt at the stake, he took her to Joyous Guard for safety. Later, however, he was besieged by King Arthur and was forced to flee Britain; at which point, the castle's name reverted to its Dolorous original. After his death in France, Lancelot's body was returned to Joyous Guard for burial alongside Sir Galehaut. The castle's story mostly appears in the Vulgate Cycle (1215), where it is said to be in Northumberland. Sir Thomas Malory (1470) more specifically states that "some men say it was Alnwick, and some men say it was Bamborough". "Aethelfrith the Artful reigned twelve years in Bernicia and another twelve in Deira. He reigned twenty-four years in the two kingdoms, and gave Din Guayrdi to his wife, whose name was Bebba, and it was named Babbanburth from his wife's name" and "Ida son of Eobba held the countries in the north of Britain, that is, north of the Humber Sea, and reigned twelve years, and joined Din Guayrdi to Bernicia"
"Ida assumed the kingdom, from whom arose the royal race of the Northumbrians, and reigned twelve years, and he built Bebbanburh, which was first enclosed by a stockade, and afterwards by a rampart". From these references, it is evident that Bamburgh's original name was Din Guayrdi, a Celtic-British place-name meaning "Fort of the Guayrdi". The Guayrdi are presumed to have been a sub-tribe of the Brigantes, a major pre-Roman tribal coalition which covered most of the North of England. The stronghold was only taken over by the Northern Anglo-Saxons during the mid-6th century reign of King Ida of Bernicia and its name changed by his grandson, King Aethelfrith. Aethelfrith's wife, Bebba, was herself a Celt and it seems that this is why she became particularly associated with the old British fortress. The place was also known as Cynclincanberg (Royal Fort) - perhaps a name used in King Ida's time. The British origins of Bamburgh are further confirmed by the 12th century chronicler, Geoffrey Gaimar, who, drawing upon older sources, wrote that King Ida "restored Bamborough. It was much decayed and ruined since Ebrauc built it long ago". 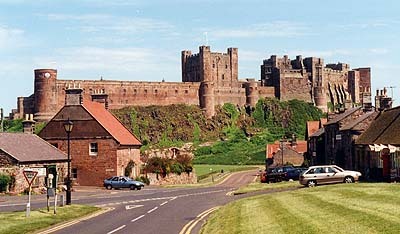 Bamburgh went on to become one of the major strongholds of the Bernician, and subsequently the Northumbrian, Royal family. It was particularly associated with the great Christian king, Oswald, who founded the nearby monastery at Lindisfarne for St. Aidan and is said to have wrought miracles at the castle. The chapel in the castle, of which only the foundations remain, was dedicated to him and once held several of his relics. Archaeology: Excavations by Brian Hope-Taylor have revealed that the site of Bamurgh Castle, the magnificent crag of the Great Whin Sill, has been occupied since the pre-Roman Iron Age; and residents have continued there uninterrupted until the present day. Hardly surprising for such an ideal natural defensive location. During the late Roman period, the west ward is likely to have been the site of a coastal signal station. The best-known and most interesting artefact found at Bamburgh is a tiny gold plaque engraved with an entwined elephant-like creature. It is Celtic in style, and may therefore be from the period of post-Roman British occupation. However, alternative dating suggests the seventh century, a period of influence from the Celtic Church in Ireland. EBK's Interpretation: It is clear that Bamburgh alias Din-Guayrdi was an important Celtic stronghold in the British Kingdom of Bryneich, long before the Saxons took over and renamed the country Bernicia. Its natural defences encouraged the Romano-British to continue occupying the old Roman beacon there in the troubled times after the departure of the Imperial administration. Security was one of the most important factors to consider in the placement of an important noble, if not Royal, residence. Geoffrey Gaimar's reference to the founding "Ebrauc" indicates Bamburgh's origins as the home of the House of Ebrauc, the ruling dynasty of the post-Roman British Kingdom of York. The Bryneich Kings were one of several branches of these descendants of old King Coel, the last Roman Dux Brittanniarum. In fact, the Bryneich monarch who was contemporary with King Arthur and Sir Lancelot was King Bran Hen (the Old), a man who can only have been the original of Sir Brian of the Isles - the Isles being the nearby Farne Islands. He too is said to have been ejected from his castle, this time by his brother. The name Din Guayrdi has, no doubt, become transformed into Dolorous/Joyous Guard over the centuries. So it would appear that Malory was correct in his identification of this place with Bamburgh. Alnwick is a much later Norman foundation, though medieval Arthurian writers may have called it Pelownes - representing "Belle-Aln," the Beautiful River Aln. In this guise, it was a castle near Joyous Guard to which the captured Sir Palomides was being taken for execution before his rescue by Lancelot.